This quote is one that's always stuck with me, ever since I was sixteen, poring over my Sherlock Holmes books. I've always had a deep love of mystery stories, ranging from classics like Conan Doyle or Edgar Allan Poe, to more contemporary authors like James Patterson and, my ultimate favourite, Agatha Christie. There was always something keeping me on the edge of my seat, or challenging me to try to figure out the culprit and/or their tricks by the end of the book. 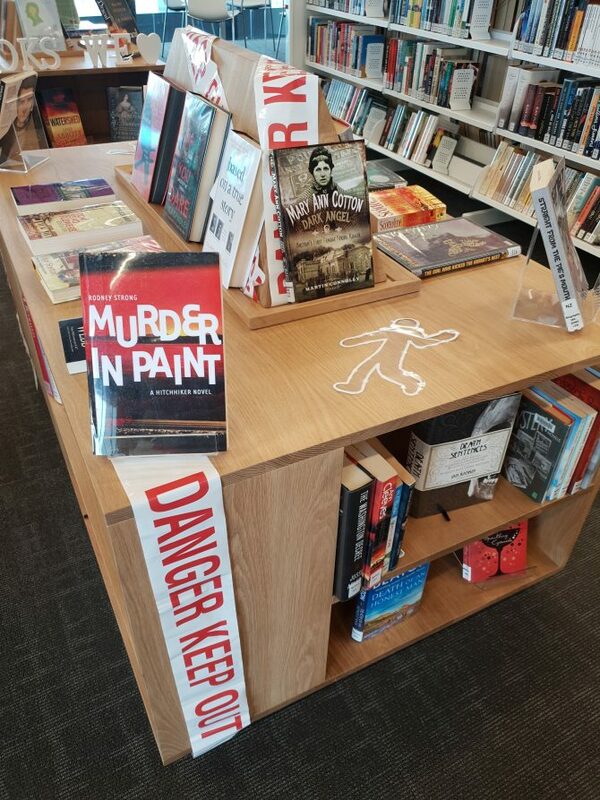 Mystery and Crime novels on display at Tūranga. As the name implies, cozy crime is much lighter than many of its counterparts. Agatha Christie and M.C. Beaton are perhaps two of the most popular cozy crime authors. I love that even though the stories are light, the plots are compelling, and you end up with a page-turner you've just stayed up all night reading. Another one that's easy to tell from the name, true crime is an excellent way for biography and non-fiction readers to get their dose of mystery. Peter Graham's books about the Parker-Hulme murder in Christchurch, and the Timaru poisonings make for very fascinating and informative reads. Another favourite genre of mine (especially Victorian crime), historical mysteries take place in different times. True crime often blends with this category too. Some key authors of historical mysteries are Maureen Jennings (the Murdoch Mysteries), and Kerry Greenwood. Short for 'Scandinavian Crime', these books are stories written by Scandinavian authors. A prime example of this is Stieg Larsson's Girl with the Dragon Tattoo. These books do tend to be darker and more gruesome. One of the very popular sub-genres, thriller mysteries are fast-paced with some similarities to action fiction. Lee Child is arguable one of the most popular thriller mystery writers, along with others like James Patterson. A crime fiction sub-genre started by Patricia Cornwell, forensic crime focuses on the scientific investigative elements of mystery and crime stories. These stories tend to draw investigation methods into focus, and are less fast-paced than some other genres. Kathy Reichs is another popular forensic crime writer. There are a variety of other crime and mystery sub-genres, such as legal thrillers, police procedurals, spy novels, and psychological thrillers. These five categories, however, illustrate how diverse and broad 'crime and mystery' is as a genre. Challenge yourself, and try a sub-genre you've never read before you may find a new favourite author! A selection of both recent and classic crime and mystery stories to suit everyone's taste. A mixture of fiction, biographies, and graphic novels, ranging from cozy crime to brutally violent, and everything in between. A classic from Agatha Christie's prolific writings, this book is a standalone masterpiece. A locked room murder of sorts, the story takes place on Soldier Island, where a group of 10 strangers start being killed one by one. An awesome biography that gives a peek into the life of a kiwi police detective. Al Lester shares stories and experiences from his 31 year career as a kiwi policeman, some of them humourous, others more intense. This courtroom murder story follows Ruby Bozarth, a Mississippi defence attorney, as she attempts to uncover evidence and defend a former college football star who has been convicted of murder. A new 2018 book from the much beloved MC Beaton, Death of an Honest man is the next in the Hamish Macbeth mystery series. Also known as the 'Dark Angel', Mary Ann Cotton is considered England's first female serial killer. This biography explores the details of her 20-victim crime spree and subsequent court case, while also challenging current misconceptions surrounding the murders. Now also a (very awesome) TV series, Alias Grace is a fictionalization of a true crime. We follow the story of Grace Marsh's life leading up to her imprisonment for double homicide, as she retells her story fifteen years later to an 'alienist'. Great read for fans of historical/psychological mysteries. A great psychological mystery, Jane can't believe her luck when she gets the chance to live in a beautiful ultra-minimalist house designed by a famous, but eccentric, architect. But, when she discovers that the girl who lived here before her, Jane starts to wonder if she might meet the same fate. From one of the queens of forensic crime fiction, The Bone Collection explore the case that inspired Tempe Brennan to trade in an academic career for one as a forensic anthropologist. Arguably one of the most popular example of Scandi Crime Fiction, The Girl With the Dragon Tattoo is a fast-paced read with very well fleshed out characters, and twists that'll keep you guessing. Now in graphic novel format. The first book in the Murdoch Mysteries series (also a very popular Canadian TV show), this book is great for fans of Victorian crime.